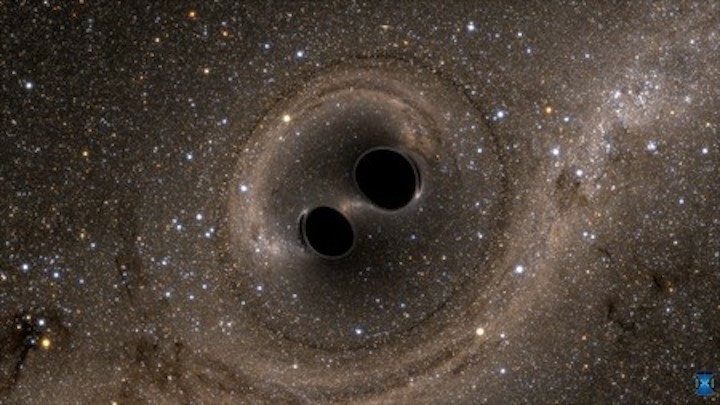 A simulated picture of two merging black holes, each about 30 solar masses. This is approximately what a human would see if they could travel in spaceship to take a closer look at merging black holes. The Physical Review Letters study, titled "High-accuracy mass, spin, and recoil predictions of generic black-hole merger remnants," was funded by the Sherman Fairchild Foundation, the National Science Foundation, NASA, the Brinson Foundation, and Caltech. Other authors includealumnus Leo Stein (BS '06) of the University of Mississippi and formerly a postdoctoral scholar at Caltech; François Hébert, a postdoctoral scholar at Caltech; and Hao Zhang of the University of Pennsylvania and formerly a Summer Undergraduate Research Fellow (SURF) at Caltech.